Dreamy architecture, great outdoor amenities, and breathtaking views of the tropical landscaped grounds, makes this Villa a perfect Hawaiian retreat for the whole group. This magnificent Villa has features such as; 1,209 square feet of luxurious living space, two bedroom suites, two full bathrooms, and can accommodate up to six guests which is a tremendous retreat for friends and family who are traveling together. Views from the living room are spectacular and unobstructed, as they are from nearly every room in the villa. 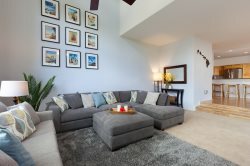 A fully-equipped gourmet kitchen features stainless-steal appliances and plenty of cookware including a blender to help create a delicious Hawaiian cocktail. The dining area seats six, and just off the living room is slider doors to a private covered lanai with a dining table that seats four and beautiful views of the golf course. The master suite features a cozy king-size bed, flat screen TV and an attached bathroom with a separate walk-in shower and a deep soaking bathtub. The guest bedroom features two twin beds, flat screen TV and the main bathroom is close in proximity. Extra guests will enjoy the comfort of a queen-size sleeper sofa. Also included is a full-sized washer/dryer, air conditioning and ceiling fans, ice chest, boogie and kick boards, beach chairs, beach umbrella, snorkel gear, beach towels, and complementary parking and complimentary WIFI. Located across the street from the Queens MarketPlace, complete with food court, art galleries, sushi, creamery ice cream, Macaroni Grill, Island Gourmet Market, Starbucks, and many other shops, daily local entertainment, classes and cultural events. King's Shops is also located next door and just a few minutes walk. Also within a 2-minute drive is the famous Anaehoomalu Bay (A-Bay) beach with all the joys of white sand, trees, snorkeling, and more. Further down the road (10 to 15 minute drive) are other local beaches, whether you want the pristine white sands of Hapuna Beach, or the rocks, trees, and safe entry spots of nearby "Beach 69" (at mile marker 69). All our villas have a well-thought-out guidebook to the local area, complete with sections describing Waikoloa Beach Resort and all its offerings, important phone numbers, Big Island life information, a guide to beaches, shopping, activities, Luau/Dining, and Golf. Our overall stay was great. The ResorticaHawaii property management team were very helpful and easy to work with. I especially want to thank Anne Marie for making the whole process simple and pleasant from beginning to end. We loved our stay and would definitely stay again. The property was beautiful, spacious and clean and had everything we needed. Thank you Allan for letting us enjoy your home. On the first day, we had a problem with the front door lock (despite the written warning). However, the maintenance team was very responsive and helpful. Overall, we really enjoyed our stay!